Your kids will think they are real cowboys/girls playing these western party games, such as Corral the Horses and Ride'm Cowboy. 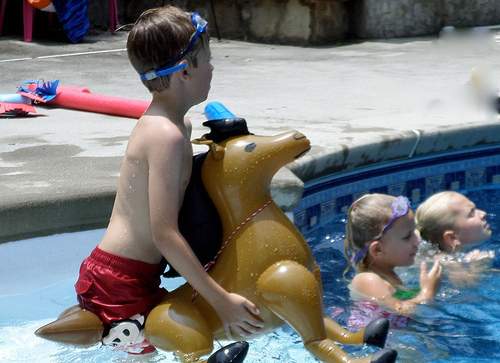 A pool and a pony kept these cowboys/girls from riding off into the wild blue yonder. Divide into two teams - the Mustangs and the Stallions. Each team gets an inflatable horse with a rope tied around it. 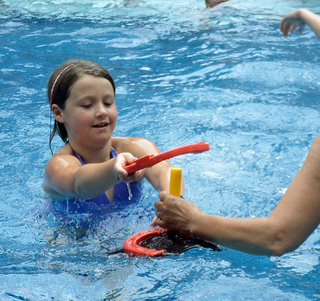 Instruct the kids to lead their horse to the corral ( a floating hula hoop) without tipping the horse over. Divide into two teams. Give each team one rubber horseshoe. 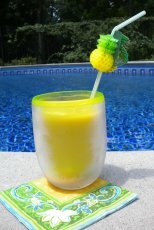 One at a time have them swim or run if the pool is shallow to the horseshoe post. It can be on the side of the pool or have a person holding the post in the pool. 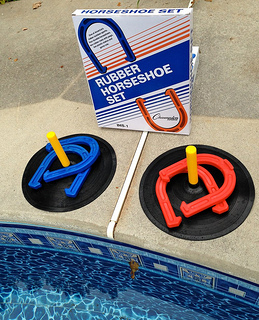 When the swimmer gets to the post they take off the other horse shoe, place their horseshoe on the post and swim back to their team giving it to the next team member. I purchased the Champion Sports Rubber Horseshoe Set from Amazon for this game. Every kid loves squirt guns. We used the Max Liquidators. 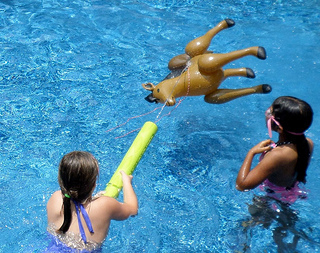 Each team member takes a turn moving the horse to the other side of the pool with squirting water. Then they swim back to their team mates pulling the horse by the bridle. 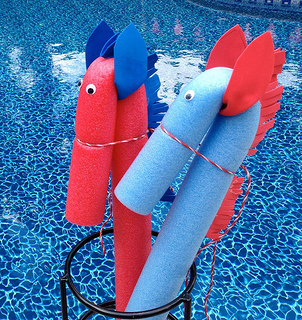 Make your own noodle horses. Bend over the noodle and tie a piece of rope around it holding it in place. Superglue googly eyes and make ears and a mane out of a sheet of foam. Measure a piece of foam about 6-8 inches long and about 2" wide. Fold it in half and then trim the edges. To get the mane to stick, I cut out a skinny wedge of foam and then superglued the mane into the cut out area. Each team gets one horse. 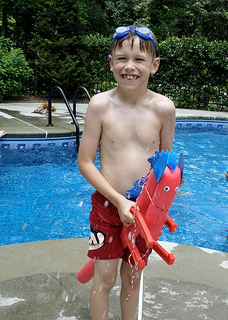 One member from each team "rides" the horse across the pool and back. Remind them they have to "stay in the saddle." Purchased 3 inflatable horses from Amazon. 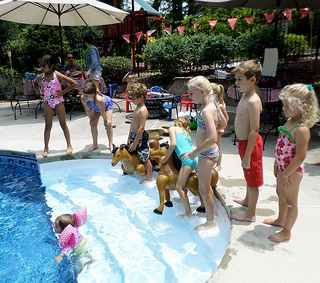 Let each swimmer take a turn and see how long they can sit on the horse before tipping over. This was the favorite game of the party. 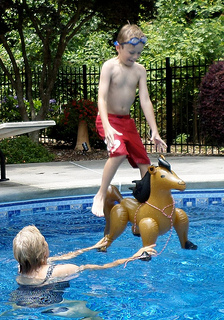 Make this your last game with the inflatable horses. 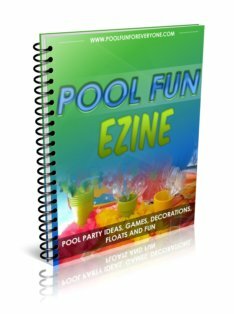 Let the kids line up behind the diving board and take turns landing on the horse. 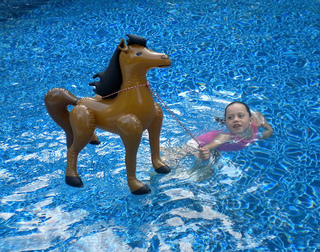 Have an adult hold the horse at a safe distance and keep it from floating too far away. Eight kids took several turns jumping on the horse - eventually all three of them popped - but it was well worth it!